The best form of prevention is not to start. Give children the best start in life and try to not give them sweets from an early age. If possible, avoid all sticky sweet foods and high sugar containing soft drinks. This includes babies with sugar containing juices e.g. Ribena, in baby bottles. This leads to the “lunar landscaped” teeth called bottle fed decay. This puts Queen Elizabeth’s efforts to causing decay, a poor second. The baby teeth don’t stand a chance! The child craves sugar and the need for the sugar “hit” is set for life. 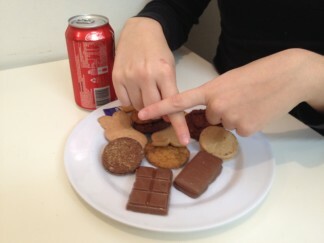 For people of all ages, reducing the amount of sugar is important, but unfortunately it’s everywhere! It’s important in reducing the risk of diabetes. Importantly for oral health, the form sugar is found in is a risk factor in decay and gum disease. The stickier the sugar the way the sugar is made, the better for it to stay on the teeth. So syrups, caramel, and toffees are some examples of sugar, with help of salivary proteins, enable the sugary “goo” to adhere to teeth. Certain bacteria in the mouth love this and happily multiple on the tooth surface. This wonderful environment is not easily removed. A mouth wash does not remove it but proper cleaning technique that actually removes the sticky mass off the tooth will. Circular motions only smears the material and wears the tooth away, but a firm wiping action with a soft brush, that forces the bristle to go between the teeth and at the gum-line, will. A dry mouth caused by caffeine, smoking, medication and illicit drugs reduce the protection that saliva provides. Without saliva we can’t control the decay. This is acutely apparent with patients who have had radiation treatments of cancer of the head and neck. The radiation causes the salivary glands to stop functioning and an extreme dry mouth occurs. The enamel – the surface layer of the tooth – is no longer hydrated and calcium is not absorbed from it. The saliva has calcium that replaces calcium lost through chemical reactions with bacteria on the enamel surface. 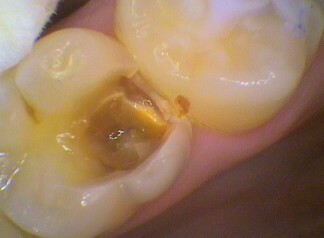 The enamel softens and is less resistant to decay. 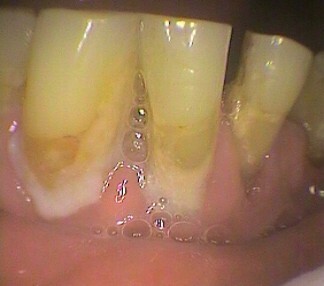 Any root surface exposed due to over brushing or gum disease is much more prone to decay. Seeing the dentist regularly is important to treat decay early or even preventing it by professionally cleaning the teeth and removing decay and placing fillings or sealants. The aim is to have an oral environment that is self-cleaning as much as possible. The human attached to the teeth can provide a less destructive oral environment by watching their diet and cleaning correctly. A professional (that is, the dentist) will remove the “caves” created by decay for bacteria to hide, and the build-up of bacteria in between the teeth and gums, that prevent proper cleaning of the mouth. Sugar can be addictive, so much so that there are moves to put a sugar tax to force a shift in the behaviour of society and the food companies. Dental and gum disease is often a forerunner of other serious medical problems. Be nice to your mouth and you will also be nice to the human providing a home for it. At Seymour Dental we want to help people have better health outcomes for LIFE!